At a PLAN-Boulder forum on Monday, January 30, a panel of five Boulder County farmers, moderated by a CSU extension agent, related, among other details, that their practices have changed significantly over the years so that they plow much less — thereby depleting the soil of less moisture — and apply less pesticides. The five panelists — Keith Bateman, Jason Condon, Dan Lisco, Paul Schlagel, and Jules Van Thuyne — reflected in a general fashion about their lives as farmers and the state of agriculture in Boulder County. Between them they grow wheat, corn, barley, sugar beets, alfalfa hay, grass hay, organic vegetables and small grains, and cattle. Lisco also raises, rents, and sells horses. All of the farmers declared that they liked farming. Each of them is descended from a multi-generational farming family — two of which settled in Boulder County in the late 1850s. Most of them lease land from the Boulder County Parks and Open Space Department and/or cultivate land encumbered by a conservation easement held by the department. 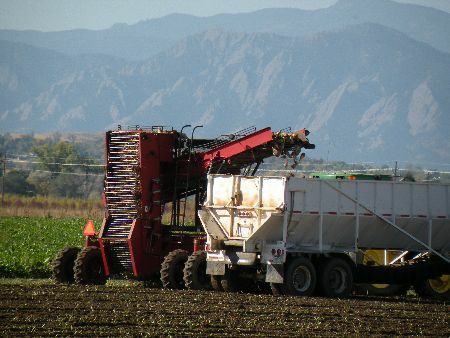 Several of them claimed that they would not have been able to farm in Boulder County without the county open space department, because farm land would have become too expensive to own or lease. Some of them recounted that agriculture in Boulder County changed dramatically in the 1970s. They said that the county had contained many dairy farms, which closed. A John Deere dealership in Longmont shut down. A seed store moved away. Feed lots disappeared. A Kuner canning plant closed. A sugar mill was shuttered. Later on, in the 1980s and 1990s, the vegetable farms around Longmont that were owned by Japanese-American families collapsed. The number of farmers dropped significantly, and the famers who hung on began to cultivate much more acreage. Schlagel commented that up through the middle of the twentieth century, “80 acres used to be enough to support a family.” Very few farmers have moved into Boulder County from other areas. One panelist commented that the changes had meant that he needed to stock many more spare parts for agricultural machinery. Others said that they led to much more time driving to and from Greeley to obtain parts. Van Thuyne observed that he spends a large portion of his time serving on ditch boards and agricultural committees, because there are fewer farmers to share the burden of collective action. Most of them claimed that their biggest challenges are labor and water. A few of the panelists mentioned the difficulty of retaining skilled labor to operate complicated, expensive machinery and sometimes make critical farming decisions. The one organic farmer on the panel, Condon, said that he employs up to 30 laborers at a time, and that locating convenient housing for them was often difficult. Lisco cited “weed pressure” as a major problem, which he asserted often originated from seeds in irrigation water and from weeds growing along the side of roads. All of them listed water as a critical concern, because they are often unsure whether they will have enough when they need it. Some, however, indicated that the Colorado-Big Thompson Project, by providing late season water, had helped to lessen the problem. One panelist, though, commented that the Boulder County Parks and Open Space Department had often blundered when buying properties by allowing their Colorado-Big Thompson water rights to be stripped off and transferred elsewhere. Bateman claimed that the location of his farms in southeast Boulder County made water management particularly tricky. He claimed that until the Denver Water Board built Gross Reservoir, South Boulder Creek used to provide significant irrigation water into early August. Condon related that he has to water his vegetables every day of the growing season and that, after his ditch rights are depleted, he depends upon buying water from the City of Boulder and other municipalities. Adrian Card, the moderator of the program, claimed that the experience of farming east of Highway 95 is quite different from that of farming west of it. Most of the panelists said that they have to coordinate the movement of their agricultural machinery along roads and highways with rush-hour traffic, sometimes having to work fields at night to accommodate vehicular transportation. Lisco, who, among other operations, runs Sombrero Ranch north of the City of Boulder, said that he used to be able to drive his horses from pastures south of the city along roads to the ranch. But for many years he has had to carry them in trucks. Condon, the organic farmer, disclosed that retail marketing demands a lot of his attention. He said that he sells his produce to retail stores — including, occasionally, Alfalfa’s, to restaurants, to a “CSA” (community-supported agriculture), and at a stand. Almost all of it is sold between Fort Collins and Denver. He commented that the stand requires a lot of labor time to staff. He also noted that he feels obligated to provide the CSA with a variety of crops, some of which entail a loss or no profit. The others said they generally sold their crops to processors or bulk consumers. Some sell corn to a large egg farm in Platteville that markets its eggs under the “Morning Fresh” brand. Shlagel said he sells beet sugar to Great Western Sugar, which, after bankruptcy many years ago, emerged as a producers’ co-op. Schlagel and another panelist said they sell barley to Miller/Coors. A couple of the farmers sell wheat to Con Agra in Commerce City. Lisco said he supplies forage on a retail basis to local cattle and chicken producers. The conventional farmers indicated that they are deterred from organic farming by the paucity of markets. For instance, they claimed that only one mill will buy organic, Boulder County wheat, which is fairly low in protein. The conventional farmers reported plowing much less than was formerly the custom, practicing “conservation tillage,” and leaving stalks and other residue on the surface of the land. This relatively new approach conserves moisture in the soil. Van Thuyne said that he has the soil in every part of his properties tested every year, so he knows exactly how much fertilizer to add. Condon, however, observed that conservation tillage is usually not feasible for vegetable farms, because surface residue is detrimental. “Getting enough nitrogen through organic sources is probably the biggest challenge of organic vegetable farming,” Condon commented. He asserted that vegetables heavily deplete the soil of nitrogen, and that to compensate for the loss he must spread on his farm large volumes of composted manure. The conventional farmers claimed that they use pesticides more sparingly than in the past. A couple of them disclosed that they used to apply “pre-emergent” herbicide to the soil at the same time they seeded, but no longer. Van Thuyne remarked that seeds are now better than before, and that he avoids pesticide use by monitoring early plant health. He observed that corn and other crops can be planted in narrower rows by using GPS technology and that the narrower rows lead to a thicker plant canopy that discourages weeds. He asserted that Round-Up is the only herbicide that he uses on corn. Schlagel said that he sometimes has to spray his barley to combat Russian wheat aphids. Lisco declared that he sprays his alfalfa with a synthetic, organic compound, sold as “Warrior,” to fight the alfalfa weevil. He claimed that he always consults with neighboring bee-keepers before he sprays to avoid harming the insects. Others recounted that they had to use special spraying techniques near residential areas to prevent dispersal of the chemicals. Condon uses no pesticides. Consequently, he said that he sometimes loses entire crops.